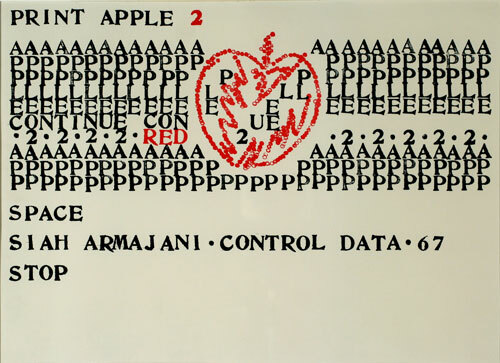 Armajani made Print Apple 2 as an announcement for an exhibition of his work entitled A Number Between Zero and One.1 That work, which comprised a computer print-out of all the digits in the number 10-205,714,079 stacked in a column that stood more than nine feet tall and weighed five hundred pounds, was later shown in the Museum of Modern Art’s exhibition “Information” in 1970.2 Armajani examines the power of text to signify information in both A Number Between Zero and One and Print Apple 2. In his early career, text evolves from calligraphy, an aestheticized means of communication, to erasure through rote repetition, as in The Warren Report, and finally to printed characters in Print Apple 2—that is, from craft to concept. Although Armajani arranged the printed characters by hand, his integration of technology into artistic practice speaks to the detachment of the artist-creator from the final artwork, an idea characteristic of Conceptual Art at this time.3 Artists reconsidered the definition of the “art object.” They understood the process that produced art to be equally as important, if not more important, than the resulting object. In many cases, art consisted of instructions detailing projects that remained unrealized. An object was not produced; the concept was the art. The various ways in which Armajani denotes “apple” also relate to contemporary conceptual practices. The appearance of the illustrated apple, the word “apple,” and the repeated letters A P P L E in various configurations work together to demonstrate multiple ways in which to refer to an apple. Artists such as Joseph Kosuth (whose work also appeared in “Information” at the Museum of Modern Art), with his seminal “One and Three Chairs” (1965), a work that juxtaposed a chair with the written definition of “chair” and a photograph of a chair, similarly explored the evocative power of text, image, and object. 1. Email message from Siah Armajani to Fereshteh Daftari, November 28, 2010. 2. The press release for the Museum of Modern Art’s exhibition discusses Armajani’s work, and is available at http://www.moma.org/docs/press_archives/4484/releases/MOMA_1970_July-December_0004a_69D.pdf?2010. 3. Email message from Siah Armajani to Fereshteh Daftari, November 28, 2010. Dimensions 9 1/2 x 13 in.